Use the interactive Kgalagadi map further down this page to explore one of the largest conservation areas in the world, the Kgalagadi Transfrontier Park. It covers the most northern corner of the Northern Cape province, stretching across the border into Botswanba. The map directly below shows South Africa with the locations of all its National Parks. Number 4 is the location of the Kgalagadi Transfrontier Park in the Northern Cape province. 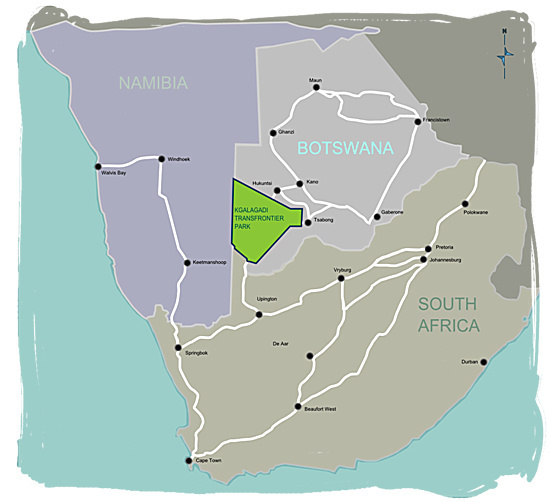 The map below is an interactive map of South Africa with the marker indicating the location of the Kgalagadi Transfrontier National Park. Go to SANParks.org to view a map of the Kgalagadi Transfrontier Park itself with its infrastructure of roads and rest camps (click on it to enlarge). Go to SANParks.org to view a map of Twee Rivieren rest camp showing the layout and infrastructure of the camp. Go to SANParks.org to view a map of Nossob rest campshowing the layout and infrastructure of the camp.